World Sauntering Day is believed to have been created in 1979 by W. T. Rabe. At that time, jogging was rapidly gaining popularity, and Rabe was concerned that people would forget how to relax and appreciate the world around them. So World Sauntering Day Was born. W. T. Rabe conceived his idea while staying at the Grand Hotel on Mackinac Island, Michigan. This hotel can boast of the world's longest porch (600 feet in length), which is perfect for sauntering. By the way, sauntering is a specific style of walking which must not be confused with sashaying, prancing, strutting, or trotting. It is walking in a slow and relaxed way, typically in no particular direction. 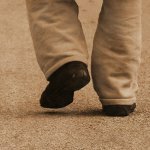 How to celebrate World Sauntering Day? On June 19, put on comfortable clothes and go for a walk to enjoy life instead of rushing somewhere and running errands. The idea of the holiday is to be pointless on purpose. Don't try to combine sauntering with walking your dog; your pet would most likely distract you from enjoying yourself.